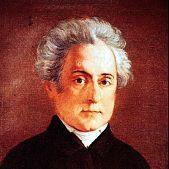 Dionysios Solomos’ name was destined to be closely connected to his poem “Hymn to Liberty”, the first two verses of which constitute our national anthem. 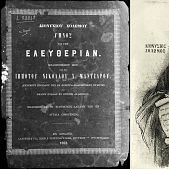 A lover of the poetic tradition, the Zakynthian-born poet, was recognised as a pioneer thanks to his passion to nurture the demotic language and combine the Cretan Literature with the demotic songs. As a profilic poet, he is established as our national poet and constitutes part of our national culture. However, as he claimed himself, the wide appreciation of the “Hymn to Liberty” operated against his other important works, like “The Free Besieged”, “The Whale”, “The Woman of Zakynthos” and “Lampros”. It is evident that he was over influenced by the composition of the poem “Hymn to Liberty”, destined to become our national anthem, that amost none of his subsequent works was neither completed nor published by himself. 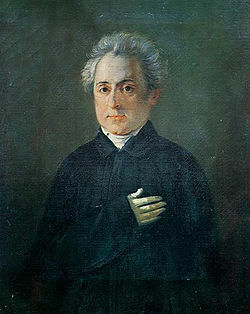 Dionysios Solomos was born on April 8th, 1798, in Zakynthos. His father Count Nikolaos Solomos was the son of Cretan refugees and his mother Angeliki Nikli had origins in Mani. Count Nikolaos Solomos was legally married to Marnetta Kakni, who died in 1802. From that marriage, he had two children: Roberto and Elena. 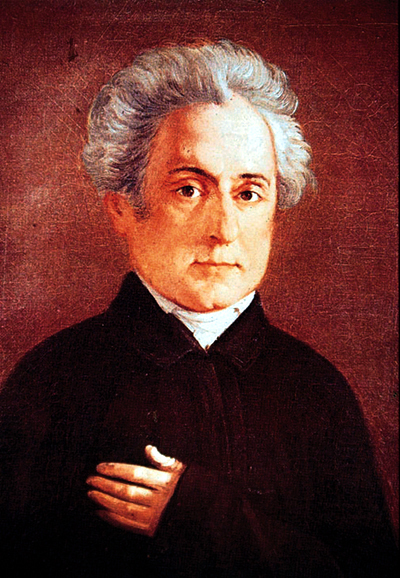 Since 1796, Nikolaos Solomos had a parallel relationship with his housekeeper Angeliki Nikli, who gave birth to one more son apart from Dionysios, Dimitrios, later President of the Ionian Parliament. His father married Dionysios” mother a day before he died on 27 February 1807, making the young Dionysios legitimate and a co-heir to the count’s estate, along with his half-brother. 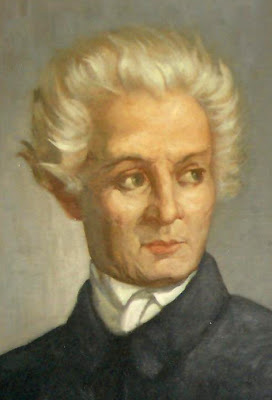 After the death of Solomos’s father, Count Dionysios Messalas gained his custody, following the supervision period of his Italian tutor, Abbot Santo Rossi, and sent Solomos to Italy to continue his studies. He was enrolled at the Lyceum of St. Catherine in Venice, but he had adjustment difficulties because of the school’s strict discipline, forcing Rossi to take Solomos with him to Cremona, where he finished his high-school studies. 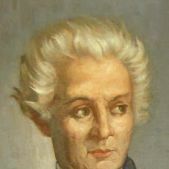 By the end of 1815, Solomos was enrolled at Pavia’s University’s Faculty of Law, from which he graduated two years later. Deeply influenced by the Italian literature and being a fluent speaker of Italian, he started writing poems in Italian. Shortly after the first attempts, his work was officially recognised and he started being fascinated by the French Enlightenment. After returning to his homeland, Solomos acquainted himself with people interested in literature, which at that time was rapidly flourishing. During that period, he got the idea to gather demotic songs from all over Greece in order to study them and discover unknown material that would develop his own work. This was a difficult task for the young poet, since his skills in the Greek language were poor, but also because there did not exist any poetic works written in the demotic dialect that could have served as models. He started studying methodically the demotic songs and the Cretan literature, and timidly made his first attempts to write in the Greek language. However, Solomos’s encounter with Spyridon Trikoupis in 1822 was a turning-point in his writing. When Trikoupis visited Zakynthos in 1822, invited by Lord Guilford, Solomos’s fame on the island was already widespread and Trikoupis wished to meet him. During their second meeting, Solomos read to him the Ode to the first mass. Impressed by Solomos’s poetic skills, Trikoupis stood silent for a moment and then stated: “Your poetic aptitude reserves for you a select place on the Italian Parnassus. But the first places there are already taken. The Greek Parnassus does not yet have its Dante”. Actually, Trikoupis was the man who helped Solomos in developing his skills in the Greek language. It is widely claimed that a poet has to compose several works and poetry collections before gaining recognition. However, this wasn’t the case with Solomos. In May 1823, he completed the “Hymn to Liberty”, inspired by the 1821 Greek Revolution. 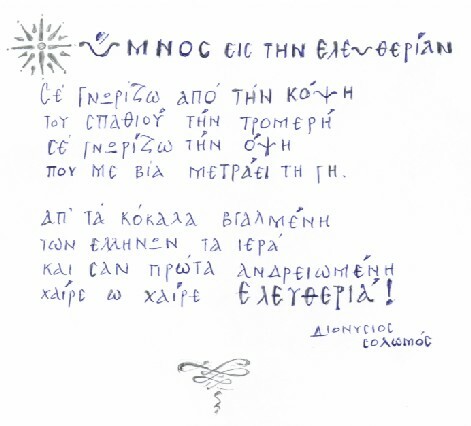 The poem was published in Greece in 1824 and also in Europe one year later. The reputation of Solomos was immediately spread throughout Greece and abroad. In 1828, a controversy emerged between him and his brother Dimitrios over inheritance issues and Solomos relocated to Corfu. 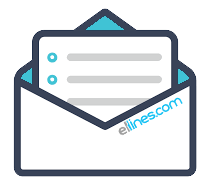 However, several people claimed that Solomos had been already planning to relocate to Zakynthos, seeking a more spiritual environment and seclusion to work on his poetry. In Corfu, he started studying the German romantic philosophy and poetry, reading the Italian translations of major writers’ works. A few years later, during the period from 1833 to 1838, further dispute broke into his family. Having restored his relationship with his brother, he found himself go against his half-brother, from his mother’s side, Ioannis Leontarakis, who legally claimed part of their father’s property, arguing that he was also the son of Count Nikolaos Solomos, as his mother had been pregnant before his death. Despite the positive outcome for the both of them, the legal battle resulted to the alienation of Solomos from his mother, choosing at the same time to distance himself from any form of publicity. However, he continued his writing work and expressed himself through his poems “The Cretan”, “The Free Besieged”, “The Whale”, which are his best works according to many. In 1849, Solomos was awarded the Gold Cross of the Redeemer. The end of Dionysios Solomos was inglorious. In 1851, he suffered from serious health issues and stopped going out of his home following his third stroke in 1856. He died in February 1857. The news about his death were immediately spread throughout the country, which mourned him with honours. – The works that Solomos started composing, but later left unfinished, were described by Kostas Varnalis quoting: “Solomos kept on writing them, but he never wrote them”. – The first two verses of the poem “Hymn to Liberty” constituthe the Greek National Anthem. 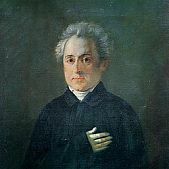 In 1828, Nikolaos Mantzaros, a Corfiot musician and friend of Solomos, set the poem to music following demotic motives, for a male quartette choir, but not as a march song. Since then, the “Hymn to Liberty” was played regularly during national ceremonies. 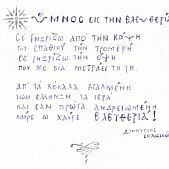 – In 1844, the poem was set to music for a second time by Mantzaros and was submitted to King Othonas to be established as the national anthem. 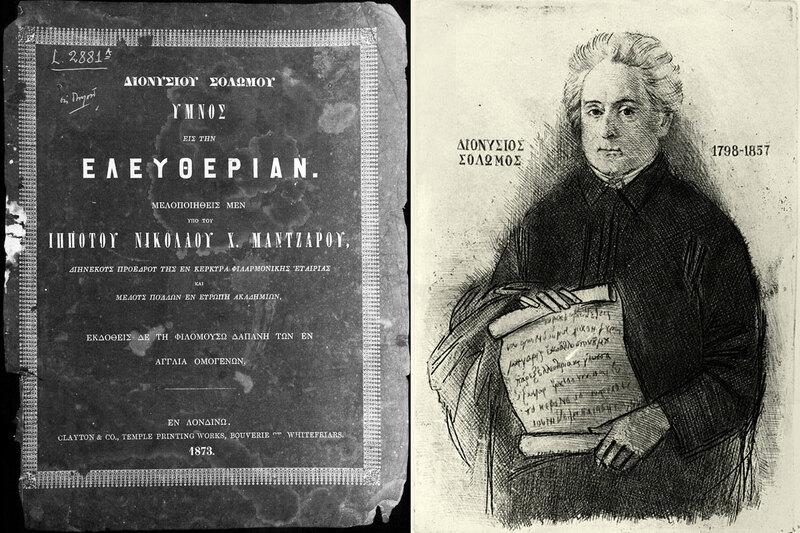 Despite the honorary award to Nikos Mantzaros with the Silver Cross of the Order of the Saviour and to Dionysios Solomos with the Gold Cross of the Redeemer, the work was propagated as a battle hymn, but it was not approved as the national hymn. – In 1861, Mantzaros was commissioned by the Military Minister to compose a military march based on the “Hymn to Liberty”. 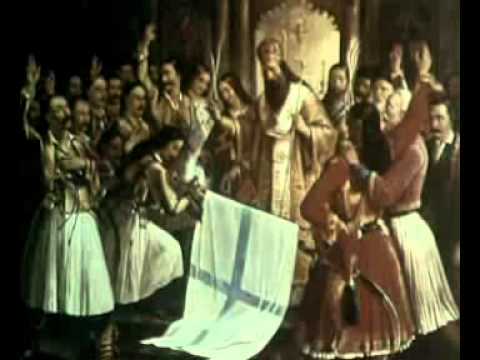 The musician adapted the beat of the Solomos’s hymn and in 1864, following the unification of Eptanisos with Greece, the “Hymn to Liberty” was established as the national anthem. The national anthem and its music were first published in 1873 in 27 copies in London. – The poem “Hymn to Liberty” consists of 158 stanzas, 24 of which were established as the National Anthem in 1865. The first two stanzas are performed and accompany the hoisting and dip of the flag and are also chanted during formal occasions and ceremonies, as a honorary tribute. – The nation shall learn to recognize as patriotic whatever is true. – Life is sweet and death is darkness. – Oh my beloved and heavyhearted folk. – Always gullible and always betrayed. – A beautiful world, ethical, created by angels. – Your strength as a sea and my will as a rock. – Night full of miracles, night seeded spell. – Light flashed and the young man knew himself.